Jay Leno's latest car review is not really a car. 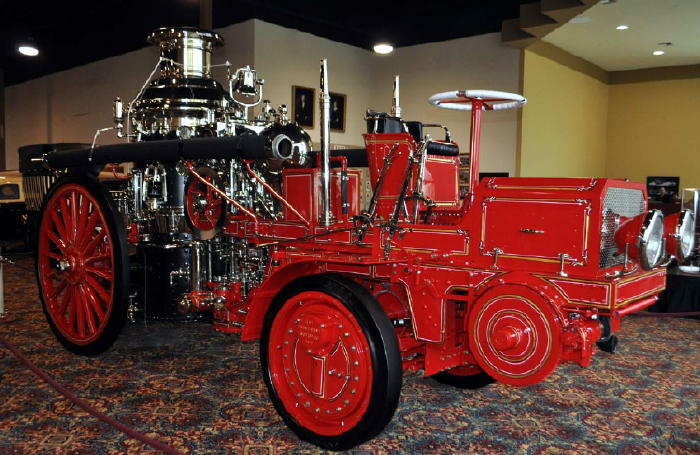 It's the 1914 Christie Fire Engine. It's one amazing piece of machinery because it's actually an adapted version of a horse-drawn cart where they got rid of the horse bit and installed an engine. Solid rubber wheels, a clutch made from just one piece of metal and a top speed in the 25 mph area. Horses had been in the fire department for about 75 years when this machine was introduced and fireman actually didn't like the modern technology because it got rid of some of the romance and adventure. The boiler on the back of this thing is just as interesting as the pulling head. It's not full of water that it pumps out. It's actually a vacuum pump that pulls water from a hydrant or a cistern and sprays it.